২০০৬ সালে হকিং ইন্টারনেটে প্রশ্ন রাখেন: "রাজনৈতিক, সামাজিক ও পরিবেশগতভাবে বিশৃঙ্খল এই পৃথিবীতে, মানবজাতি কীভাবে আরও ১০০ বছর ঠিকে থাকবে?" পরবর্তীতে তিনি বিষয়টি পরিষ্কার করে বলেন, "আমি এর উত্তর জানি না। এজন্যই আমি এই প্রশ্নটি করেছি, যাতে মানুষ এই বিষয় নিয়ে ভাবে এবং এখন আমরা যে সমস্যার সম্মুখীন হচ্ছি তা সম্পর্কে সতর্ক থাকে।"
↑ "Stephen Hawking's Universe" (HTML). PBS Online. Retrieved 2008-06-11. ↑ "Stephen Hawking to give up prestigious Cambridge title". ↑ Dr. Hawking, Stephen W. 1994. Black Holes And Baby Universes and Other Essays. Bantam Books, London. আইএসবিএন ০-৫৫৩-৩৭৪১১-৭. ↑ "Then, in 1999, his former wife published Music To Move The Stars: My Life with Stephen, in which she detailed (...) how her Christian faith clashed with his steadfast atheism; (...) The last line in A Brief History Of Time is famous for saying that, if we could tie together the equations describing the universe, we would "know the mind of God." But, as his former wife says, he is an atheist. So why is the deity making an appearance? The obvious answer is that it helps sell books." 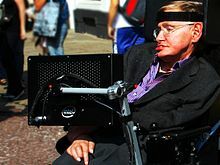 Charles Arthur, 'The Crazy World of Stephen Hawking', The Independent (London), October 12, 2001, Features, Pg. 7. ↑ "Jane took much of her dramatic hope at the time from her faith, and still sees something of the irony in the fact that her Christianity gave her the strength to support her husband, the most profound atheist. 'Stephen, I hope, had belief in me that I could make everything possible for him, but he did not share my religious - or spiritual - faith.' " Tim Adams, 'A Brief History of a First Wife', The Observer, April 4, 2004, Review Pages, Pg. 4.